The more people and cookies, the more room and tools you will need. I have double ovens which allows us to bake a lot of cookies. I use my kitchen, dining room, sunroom, and set up additional tables in garage. If you don’t think you will have enough space contact your local church, fire hall, or senior center and see if they will rent out their kitchen to you. 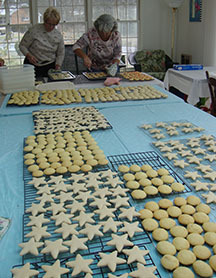 All that being said remember you don’t have to have a lot of people and make thousands of cookies. It is about the time you spend together and the memories you make. The cookies are a nice bonus.